Holiday Specials - Give The Gift of Music! 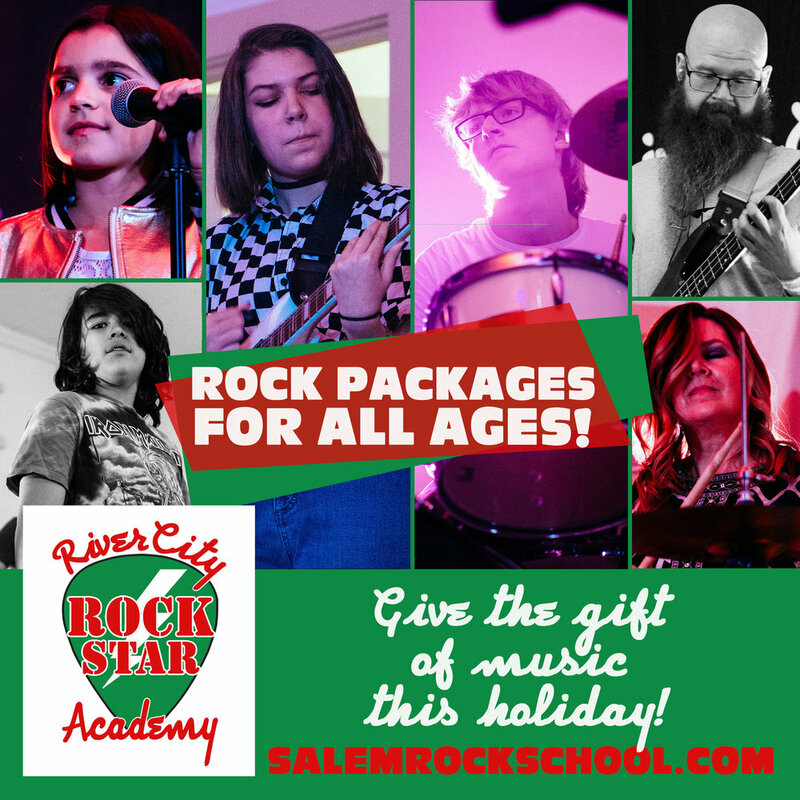 We have a number of special offers on music classes, private lesson packages, gift cards, summer camps, and merchandise to make your holidays rock. To take advantage of these deals on music classes, lesson special and camps a $50 deposit applicable towards program tuition is required to be paid by Monday, December 31st, 2018. Our staff will follow up after purchase of the deposit and go over payment options, any additional discounts available for families and one time payments. Gift card special will be applied after purchase. Any questions that you may have feel free to contact us. 15% Off Renegades Program (12 weeks + shows) Over 30 hours of music instruction in one season! Class Includes a 2 hour weekly band rehearsal and a weekly 30 minute weekly private lesson, two performances including a Mid Season and End of Season show, and a RiverCity t-shirt. Dad’s best gift ever! Save on Dad's Gift Now! 15% Off Renegades Program (12 weeks + shows) Over 30 hours of music instruction in one season! Class Includes a 2 hour weekly band rehearsal and a weekly 30 minute weekly private lesson, two performances including a Mid Season and End of Season show, and a RiverCity t-shirt. Mom’s rock! Save on Mom's Gift Now! Save $25 on our Pop Rocks (ages 5-7) (6-week program + studio performance) Only $125 now for the class. Includes RC logo music goodie bag. Add 6 weeks of private 30 minute weekly private lessons during the program for only $75 more and save over 40% on this introduction to music program! 15% Off Young Rockers Program (Ages 8-12) (12 weeks + shows) Over 24 hours of music instruction in one season! Class Includes a 1 1/2 hour weekly band rehearsal and a weekly 30 minute weekly private lesson, End of Season show, and a RiverCity t-shirt. Make music education fun! 15% Off Any Rockers Program (Ages 12-18) (12 weeks + shows) Three different programs to choose from including Mix-tape & Metal Mania! Over 40 hours of music instruction in one season! Class Includes a 3 hour weekly band rehearsal and a weekly 30 minute weekly private lesson, including a Mid Season and End of Season show, and a RiverCity t-shirt. Teens excel on stage and off with these programs! Save 25% off tuition for any summer camp. Three summer camps for ages 6-12 and all abilities. Save 15% on any RiverCity logo merchandise from shirts, hoodies, bags, jewelry, hats, beanies, and more! Purchase a RiverCity Gift Card for $100 and receive $15 extra Rock Bucks in value per $100 purchased. Gift Cards can be purchased for any amount and can be used for any music class, private lessons, camp tuition, RiverCity merchandise or any combination.